Many carved stones survive from early medieval Scotland and Ireland. The early medieval period usually means from perhaps 500AD through to 1000AD or 1100AD. This long period of time saw the arrival of Christianity and the development of the political groupings and nations (England, Scotland, Wales etc.) that we know today. The carved stones are mostly crosses. Tall stone crosses were erected outside important churches and ecclesiastical centres. The crosses were often decorated all over with scenes from the bible, especially the old testament. The scenes were carved in relief and I presume were usually painted in bright colours. Nowadays, the stones have suffered from over 1000 years of exposure to the elements and so are very worn - the effect is rather like trying to appreciate a fine, colourful and detailed painting, by looking at an out-of-focus black-and-white photograph of it. We have to squint and strain our eyes to work out what is going on. The other thing to remember is that the early medieval sculptors and artists were not like modern day newspaper photographers - they were not trying to capture true-to-life images of the people and events around them. They were more like comic-book artists or caricaturists, trying to compress a mythical or religious idea down into a stereotyped and eye-catching panel. So, people might be drawn distorted or different sizes; poses might be impossible; the same person might appear twice in the same scene; and the props and objects with the person are there for symbolic reasons as 'attributes', to emphasise the actions or characteristics of the person. In the cycle of imagery that was common in this art, King David was an important character. There were various ways of drawing David, depending on the message of the art - he could be shown as a shepherd, fighting the lion, fighting Goliath, or playing the harp. Obviously it is the harp depictions that interest us here. Helen Roe describes how the stereotyped image of David playing the harp that we find in early medieval sculpture, originally derives from classical images of Orpheus playing the lyre, seated on the back of a lion. Over time, the lion with its four legs and its raised head, changes gradually into a high-backed chair. The lyre changes shape as well, going from a U shaped object to an oblong or C shaped object and finally turning into a triangular object. We can divide the depictions by the shape of David's instrument. The following stones have oblong instruments, usually described as “lyres”. This Irish cross is rather small and crude. It has two small rectangular stones, one each side of it. One of these has a seated figure with an oval lyre. There is no chair. This ancient churchyard has two high crosses, each having David with a harp on one of the side arms. The two Davids are quite similar. Each sits on a high-backed chair and holds a large lyre with a flattish base. The sculpture is quite simple and stylised. The lyre is similar shape to nearby Ullard. There is also a nice round tower, and a hogback tombstone, in the churchyard. This very fine Irish high cross has a rectangular panel showing David playing a lyre. The lyre is a long oval shape, and the fan shaped spread of strings is well drawn - this instrument looks very much like archaeological lyres discovered from England and Germany. David sits on a strange shaped seat, only part of which is shown in my sketch, perhaps representing the lion-seat. 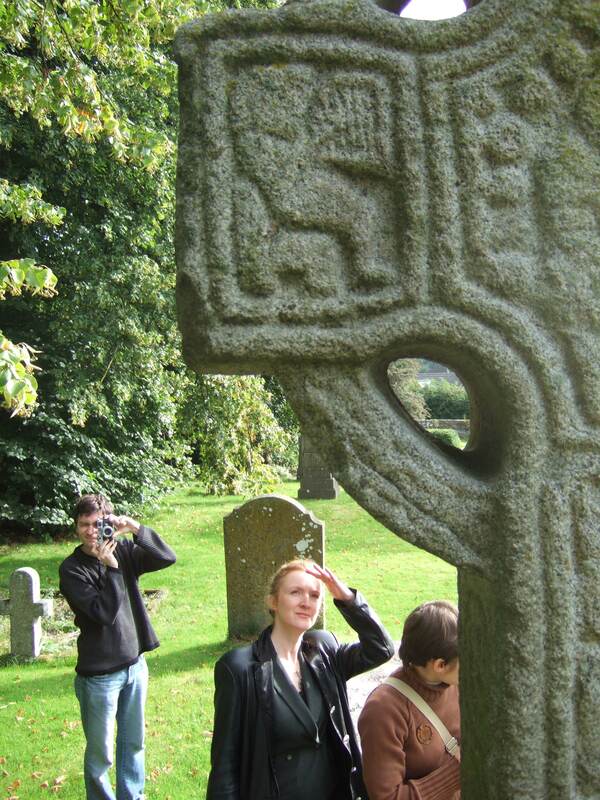 This very fine Irish high cross has David playing the lyre or harp squeezed into one of the cross arms. His chair is rather abraded (not shown in my sketch). His instrument is of the complex form similar to the Cotton Psalter. The image shown here of David playing a lyre or harp comes from an early 10th century Irish manuscript, and clearly shows the half-lion- half-chair form of David's seat. The instrument is a strange kind of lyre with an asymmetrical frame. The manuscript shows more detail than stone carvings, but because this manuscript was badly damaged in a fire the image is not very easy to see today. (Illustration from The Archaeological journal, Volume 7 p24). This damaged cross shaft has a scene of King David with a lyre. His seat is very plain, but beneath it is some kind of damaged figure perhaps representing the lion-seat. This Irish high cross has David playing the lyre on the left arm of the cross. Bunting illustrated this carving and showed the instrument as C shaped but it is clear that it is really an oval, fairly similar to the Castledermot crosses which are not too far away. This high cross is now broken into fragments and is housed in the Abbey museum. On the back side, on the left side arm, is the figure of David playing a lyre. The lyre has the same lop-sided oval shape as the one depicted on St Martin’s Cross. The right hand arm has just two figures and the central boss is missing. This high cross has two seated musicians facing each other, on the main shaft. The one on the left has an oblong or oval shaped lyre, similar to the one on St Oran’s cross, and the one on the right has triplepipes. The harper seems to be seated on a plain object. The following stones have C-shaped instruments, perhaps best understood as bow-harps, like ancient Egyption or Burmese harps. This cross slab contains a very similar scene to Aberlemno which is not too far away. The slab is in much poorer condition and now stands outside in the garden of a private house. The following stones have triangle-shaped objects, usually described as “harps”. The ones in Scotland are often described as “Pictish harps” but I don’t see this as a useful label. The ones in Ireland are often overlooked since they have been described as “asymmetrical lyres” which I don’t find useful either. This high cross has King David squeezed into the upper arm of the cross. His chair is rather shrunk into the corner. He seems to be holding a triangular instrument with all straight sides. The bottom of the triangle is squared off, and so some commentators describe this scene as showing a triangular harp held between the thighs or knees, while others call this a “quadrangular lyre”. This superb high cross has David playing the harp in the left arm of the cross. Behind him is a pipe player. David sits on his chair and holds a large triangular instrument. The bottom of the triangle is squared off, and so some commentators describe this scene as showing a triangular harp held between the thighs or knees, while others call this a “quadrangular lyre”. On top of the instrument is perched a bird. A rather obscure scene on the shaft of this cross has a figure seated on a stool or chair, with a long slender triangular object in front of him. A second figure holds an object. It is possible that this scene represents David and Saul, and that the triangle is meant to be a harp. However it is hard to say more about this very crude and abraded carving! This cross slab has been moved into Brechin cathedral. It shows a harp on its own presumably as a symbol of King David. The harp is triangular with a curved forepillar. Behind it is a straight rod, which some scholars suggestis a pipe or whistle. This cross slab has three figures beside the cross shaft, the top one with a triangular harp, the middle one with triplepipes, and the lower one perhaps with a drinking horn. The figures are very stylised and have no legs or seats. The edge of the slab is damaged and so the harp is missing its forepillar. This stone has two standing musicians on it, one with a triangular harp and one with triplepipes. Between them is a rectangular item that may be a drum. This cross slab shows a harp on its own by sheep, presumably as a symbol of King David. The harp is triangular and all three sides are straight. The rest of the slab has hunting scenes and there is a large figure, presumably of King David fighting the lion. This impressive cross slab used to stand on the hillside overlooking Forteviot, the ancient Pictish royal capital. Now it has been moved inside Dunning church. It includes a large panel showing David playing the harp. 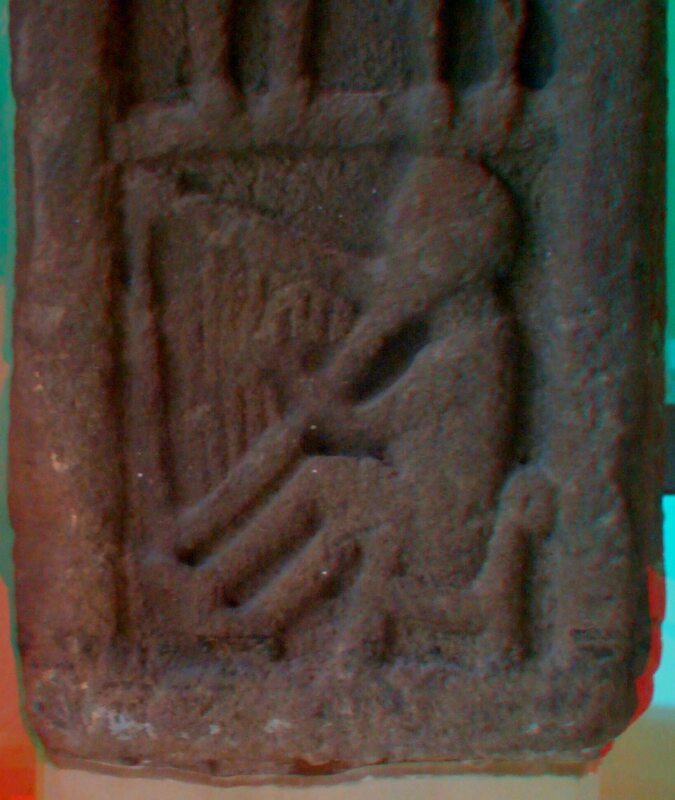 The harp is very large and seems to have animal head terminals. The chair is very small. David is als very out of proportion with a giant head and tiny feet. The cross includes an inscription with Gaelic royal names on. This cross slab contains a triangular harp. Trench-Jellicoe, 1997, a photo and commentary. The photo is not clear enough to convince me. A fragment with a hand and some scores in the stone. Some scholars say this fragment is part of David playing the harp but this seems ridiculous to me. Looks like a loom to me. See Ross. Definitely not a musical instrument, this is letters in the form of a man fighting a monster. See Buckley. Ann Buckley, ‘Representations of musicians in medieval Christian iconography of Ireland and Scotland as local cultural expression’, in Katherine A McIver, Art and music in the early modern period, 2003. Depictions - more ancient images of Gaelic harp players.